Customer have been asking for more freestanding racks and we have delivered in time for the holidays and the ski and snowboard season. Our Free Standing Surfboard Rack has always been a big seller and we always hear from customers that they love it because it is just so easy to use. 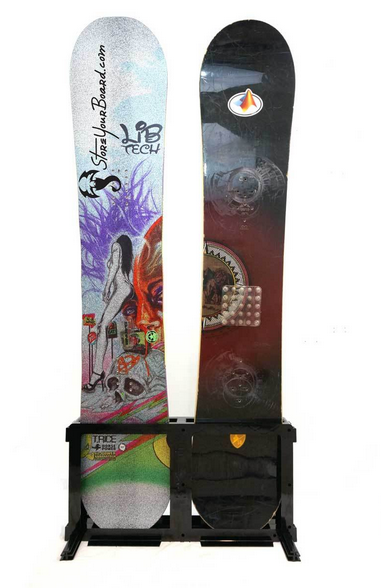 Now you can get the same ease of use in ski and snowboard racks. These are ready to go out of the box and hold your skis and snowboards very securely. They are also very easy to move around should you want to have them one place during the ski and snowboard season and them move them to someplace out of the way for off season storage. They are also portable so you can bring them to you ski cabin so you don't have your gear all over the house! Let us know what you think of the new racks. Are there any other types of racks you have been looking for but can't find on StoreYourBoard.com? We strive to have the best selection of board racks anywhere! I think I need this so our skis aren't just left out on the the floor. It's not very safe for the skis and the children.